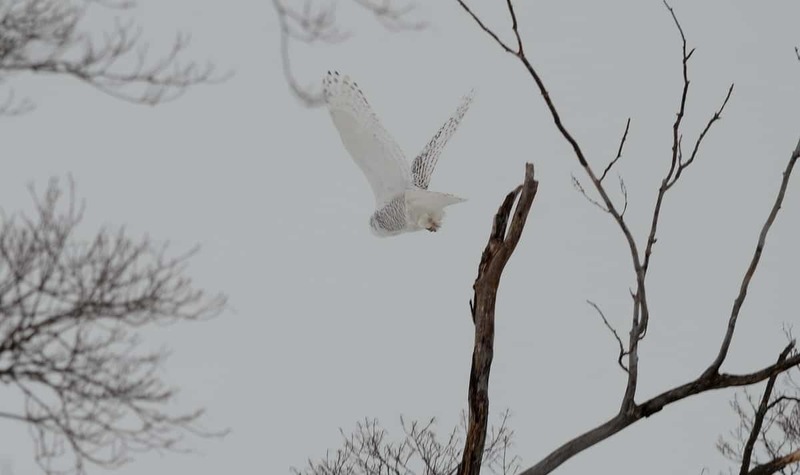 An irruption of Snowy Owls in southern Ontario in the winter of 2017/2018 gave Bob and I huge expectations of seeing one. Reports had been pouring in from all across the province, so we made plans to go touring with friends in the hopes of turning up a couple. 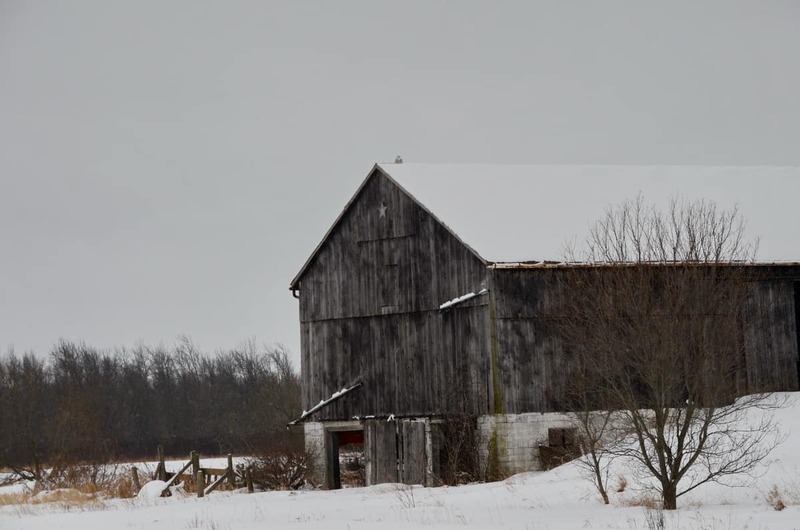 On the designated day, we were up before the crack of dawn and made our way to the Kawartha Lakes region near Lindsay, Ontario. Everyone rendezvoused at a local coffee shop before setting off in a convoy of two cars. For several hours, all we saw were empty farm fields. 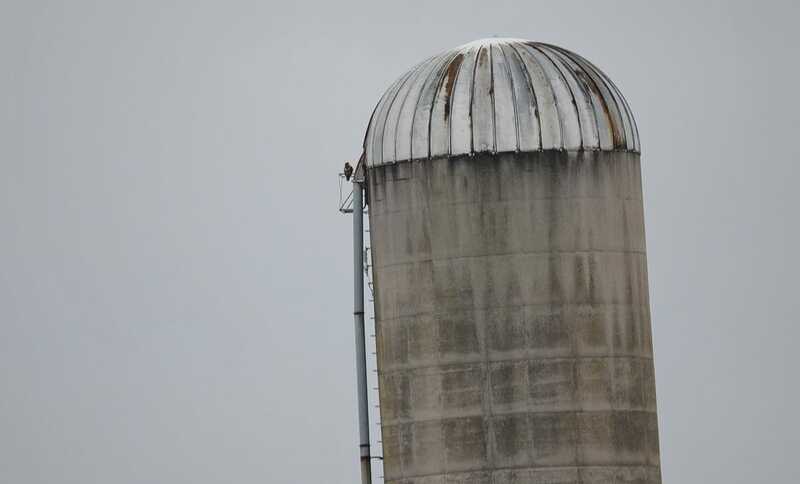 Out of desperation, our group piled from the cars to photograph a distant Red-tailed Hawk on the lee side of a very tall silo. 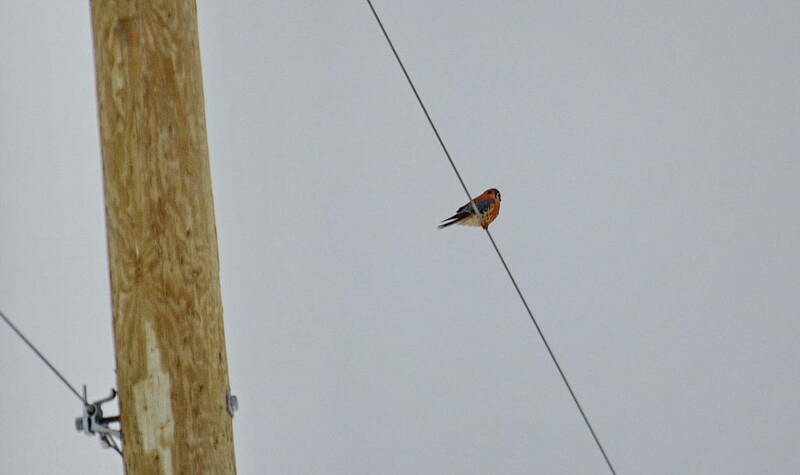 While driving the network of lanes and county roads, we noticed a panicked flock of European Starlings that drew our attention to this small falcon, an American Kestrel. 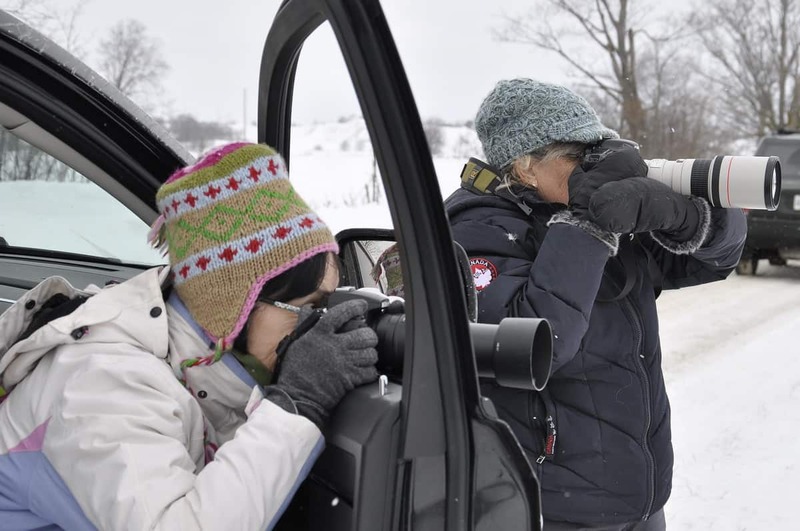 The benefit of birding with fellow birdwatchers is the increased chance of sighting any number of avian species. The more eyes searching the landscape, the better. I had been so focused on scanning the farm fields that this Red-tailed Hawk totally escaped my attention. Good thing one of our friends picked it out so we had the chance for a couple of photos. 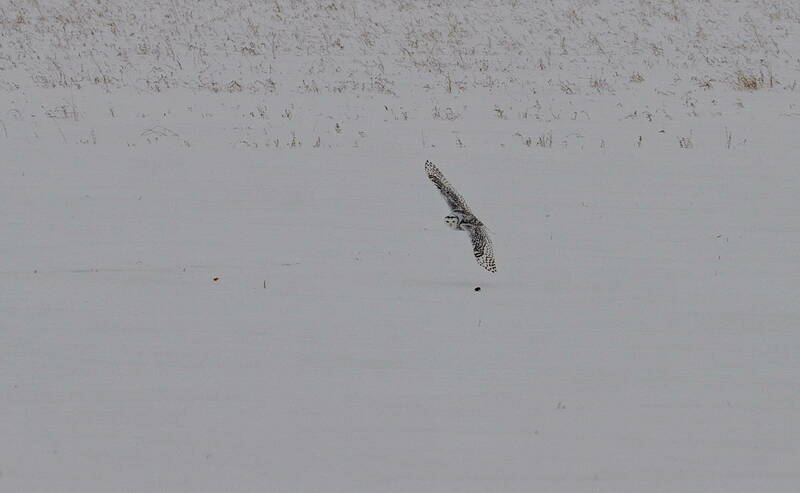 But back to Snowy Owls. The first one located on this overcast day was so well camouflaged that only previous knowledge of its whereabouts had our friend, Wendy, pointing it out to the rest of us. 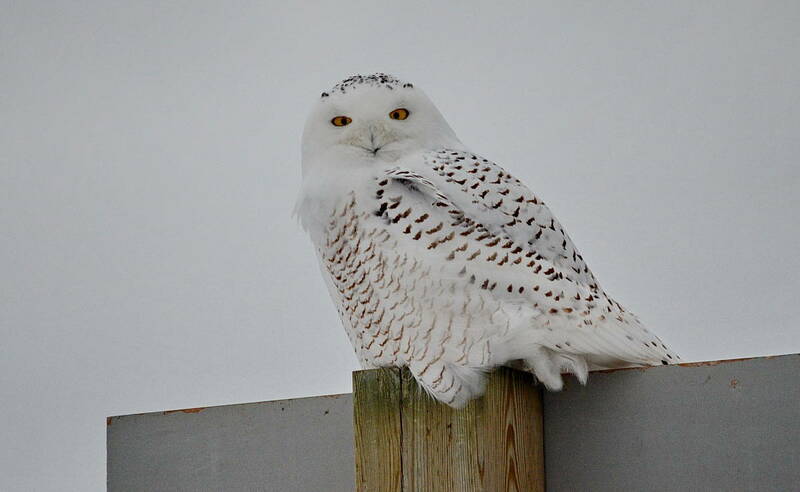 The owl so much resembles a clump of snow that most casual observers would never pick it out. 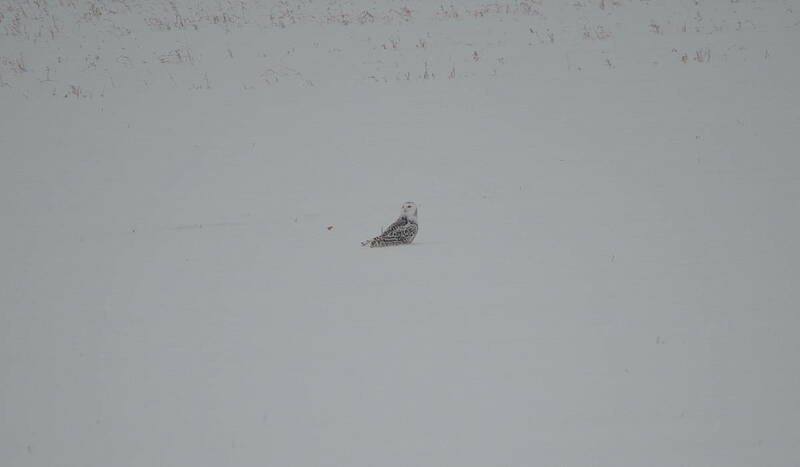 This was Snowy Owl #1! 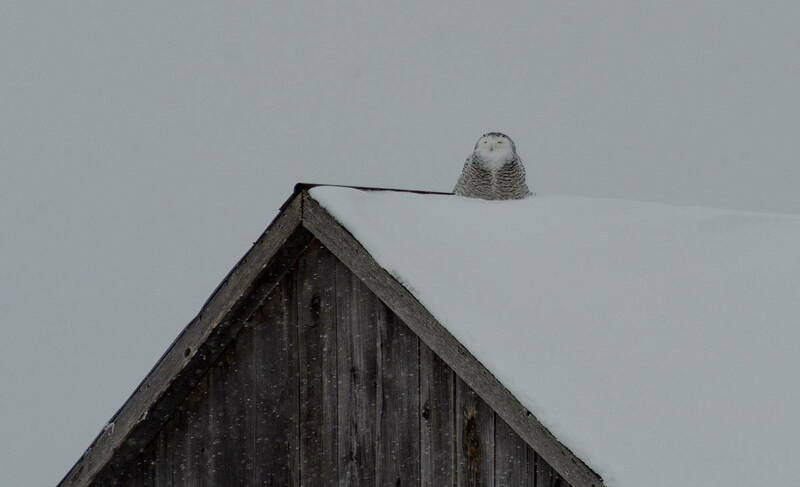 Snowy Owl #2 that day stood out a little more where it perched on top of a barn. Still, Bob and I would have overlooked it so busy were we searching fence posts and utility poles. This heavily barred female was keenly aware of us as we stood at the side of the road with cameras aimed in her direction. The lack of sunshine on this dull winter’s day did nothing to accentuate the beautiful plumage of a Snowy Owl or any bird for that matter. 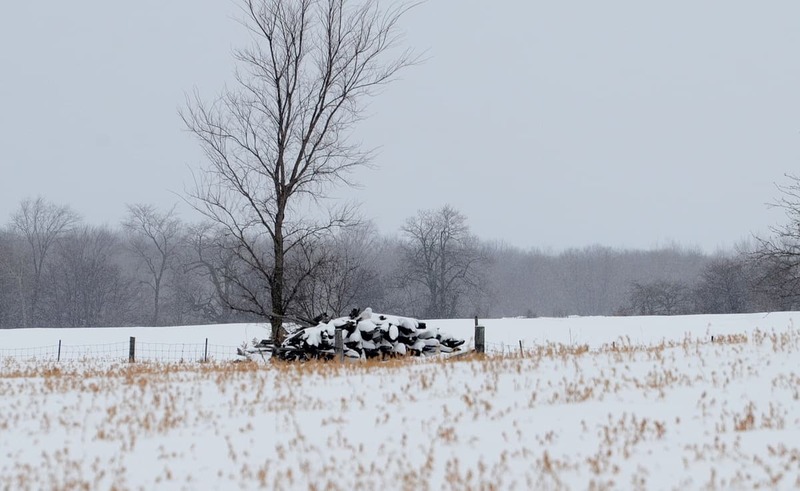 The forecast for a clear, bright day went by the wayside when a storm front moved in and light snow began to fall. Snowy Owl #3 gave us the best views yet that day, perched right at the edge of the road on a weathered snag. 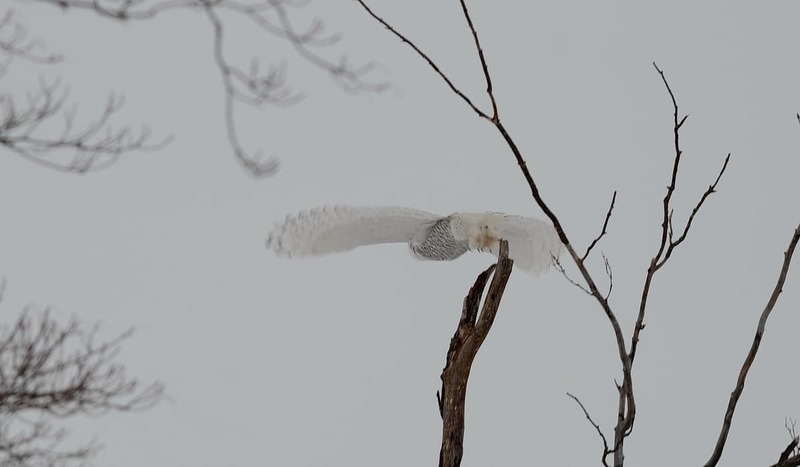 Though we faced very little traffic plying the series of country roads that day, still, it was the passing of a vehicle that alarmed this Snowy Owl causing her to take flight. The wingspan is right impressive when viewed from this angle. 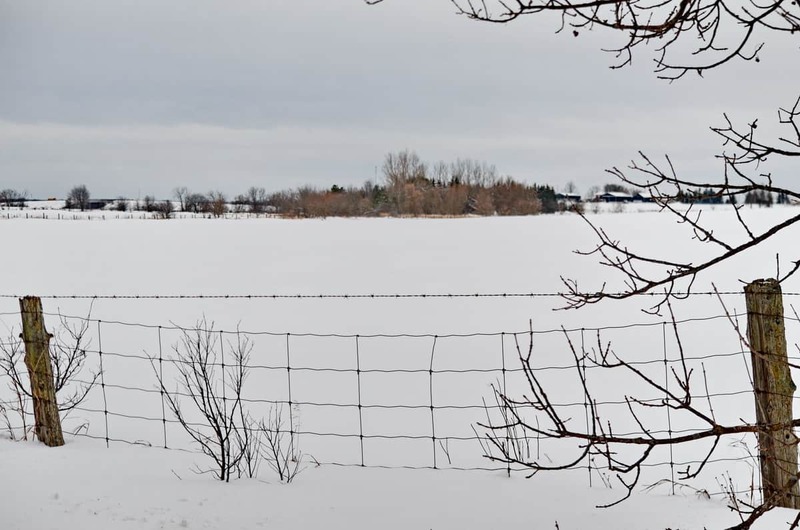 We quickly lost sight of the Snowy Owl when it flew off to the west, but then it caught us off guard when it came soaring in over the empty field on the other side of the road. Quick reflexes resulted in this photo. Having separated from half of our group shortly after lunchtime, it was just Wendy, Bob and me left scouring the farm fields for these Arctic predators that have come south for the winter months. 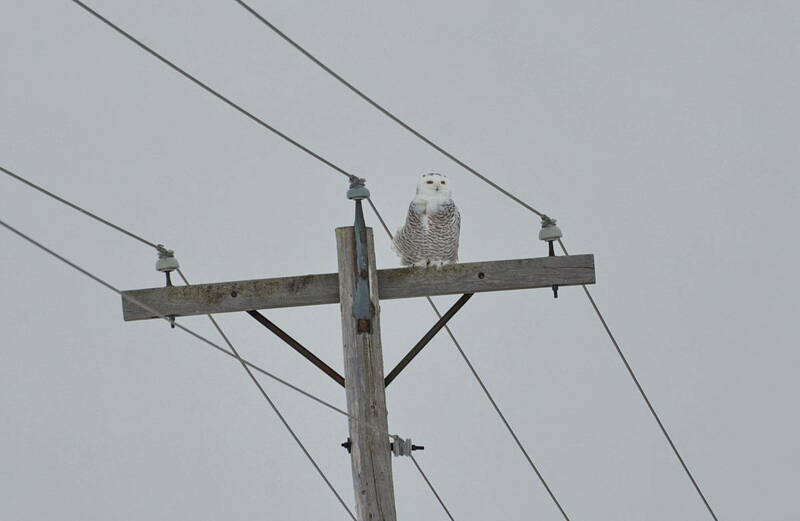 Snowy Owl #4 was found sitting on a hydro pole between the snow-covered road and a windblown field. It obliged us by staying put for a very long time. Another motorist happened by and stopped her car in order to share some information. 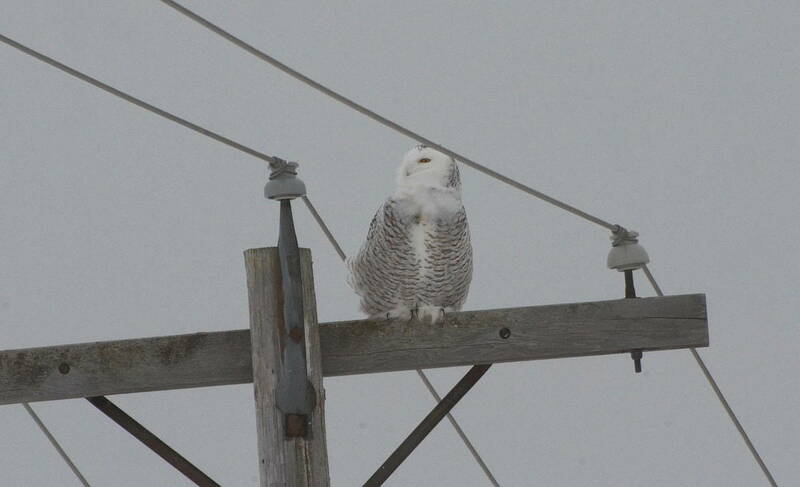 This Snowy Owl, she said, had been perched on the hydro pole when she passed by a good hour or more earlier. 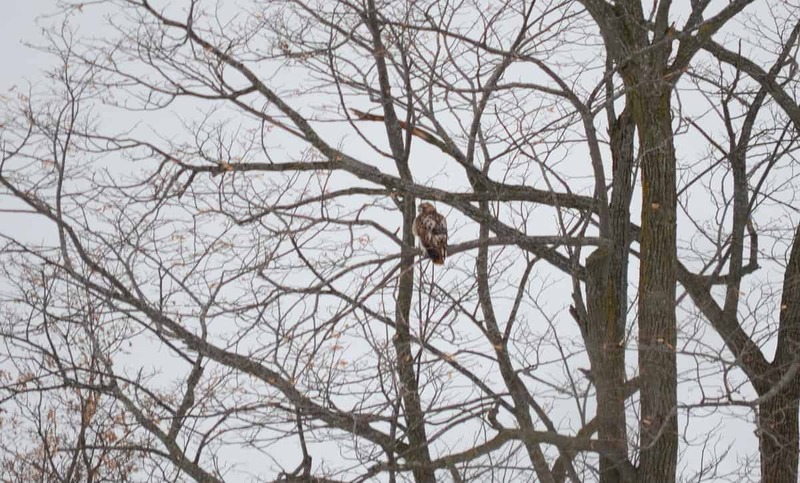 Still, the Owl did not offer to move even as we had our cameras poised for a flight shot. 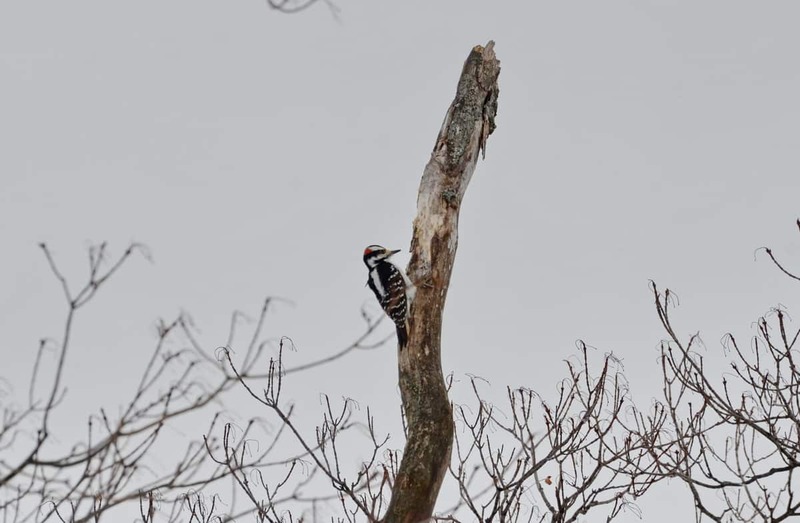 A momentary diversion came in the form of a Hairy Woodpecker pecking a rhythmic series of taps on a long-dead tree trunk behind us. and landed to investigate something of interest. Wendy and I were poised with cameras ready for whatever might happen next. 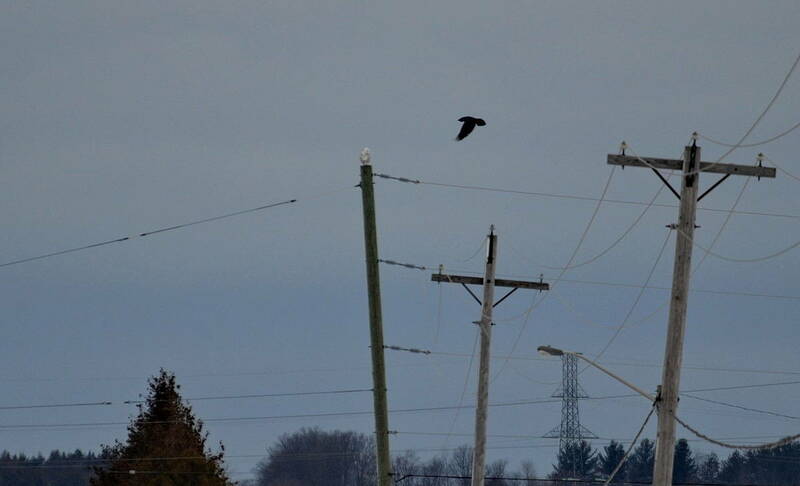 Perhaps with prey in its talons, the Snowy Owl made off for the far end of the field and landed perfunctorily on top of a telephone pole. An American Crow was having none of it and repeatedly swooped in close to the Owl. Several times, the Crow harassed the Owl; the Owl stood tall and held its ground. 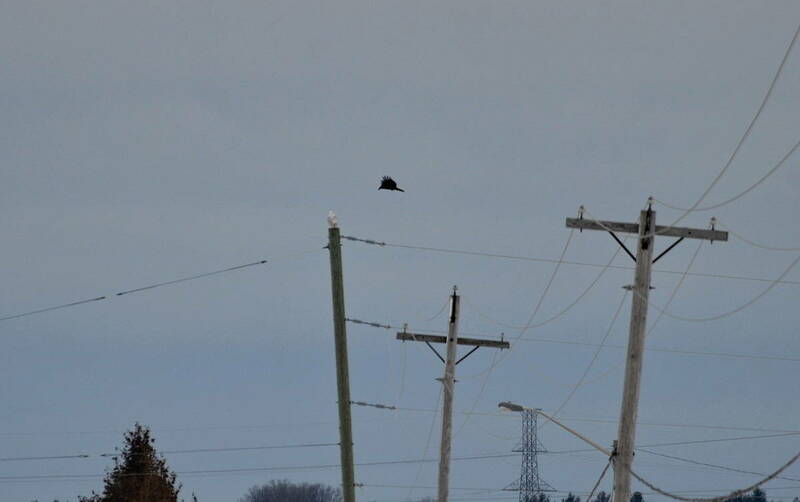 Eventually, the Crow dove down to the ground at the base of the telephone pole and snatched something out of the snow. 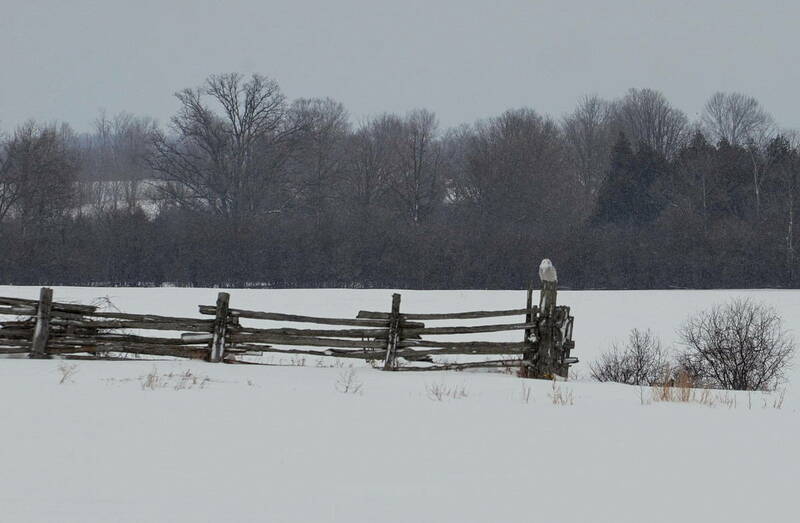 Obviously, maintaining surveillance over its territory, the Snowy Owl flew back the distance from the far end of the fallow field and assumed its place on a fence post. 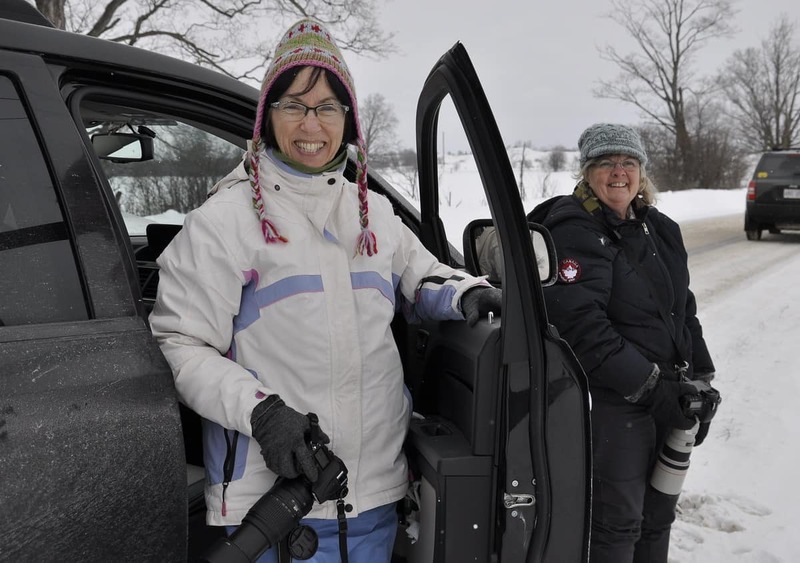 Jean and Wendy were happy that this Snowy Owl had put on such a great show. It was now time for us to go our separate ways. 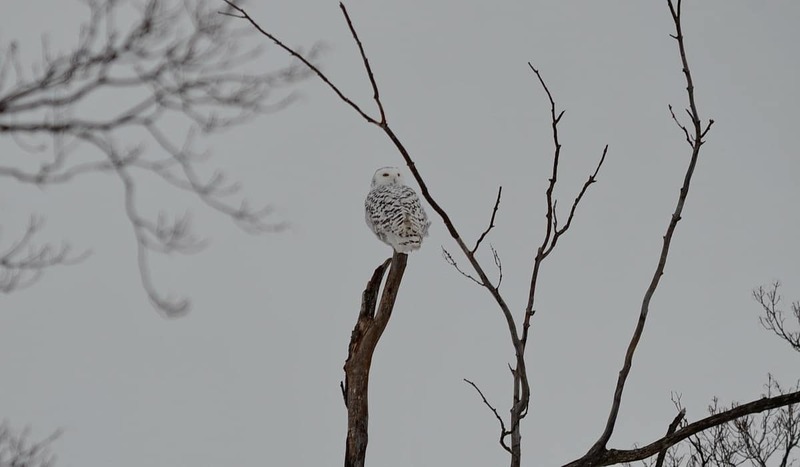 Bob and I were grateful for all the help that our friends gave us over the course of the day, but I’ve got to tell you that the satisfaction I felt when I spotted a Snowy Owl on my own was very satisfying. 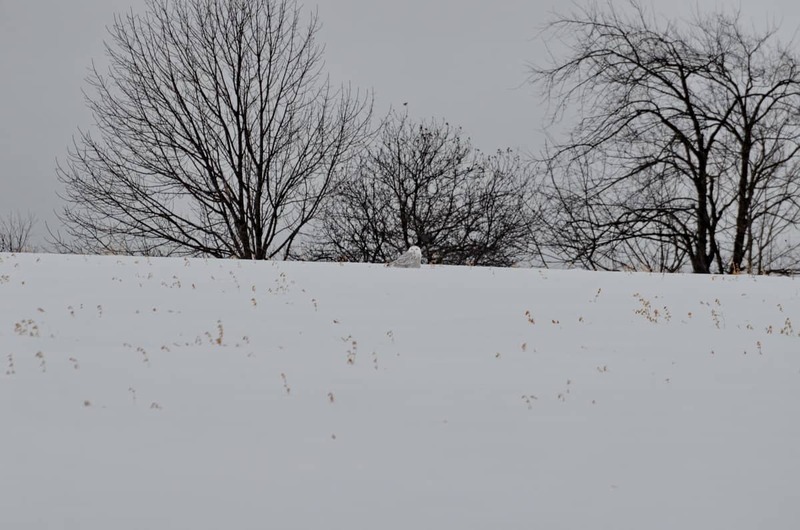 I had picked out the silhouette of Snowy Owl #5 where it huddled on the gentle slope of a rolling hill. 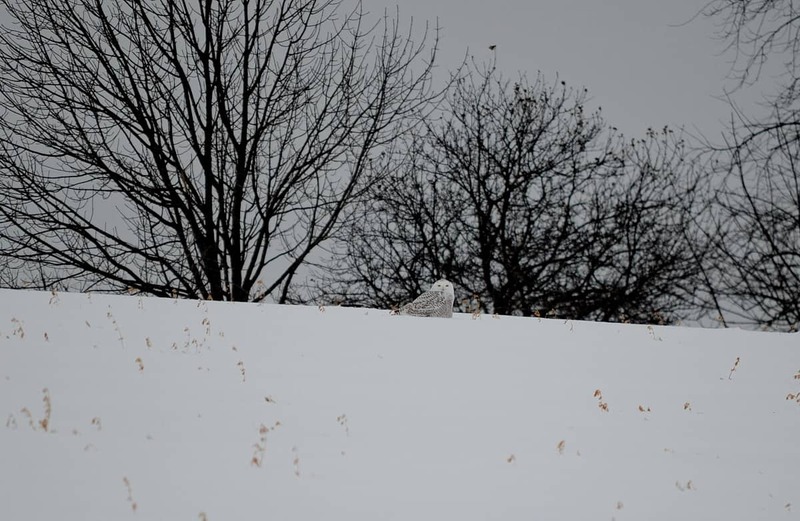 Quite a distance separated the Owl from the highway, but it was keenly aware of our movements as we trudged along the shoulder of the road in an attempt to position the Snowy Owl with the black tree branches behind it. Using my unipod, I took careful aim for the dwindling light did nothing to compensate for the camera shake. And then we continued on our way. 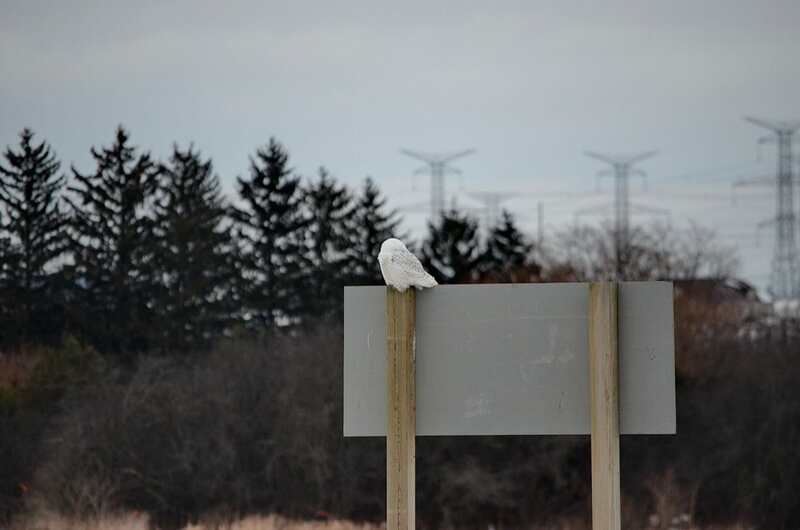 A prompt u-turn was safely carried out, and then we parked some 300 feet away from this Snowy Owl #6 of the day and stealthily opened the car doors to take some photographs. The owl was very cooperative and glanced our way in between searching the adjacent meadow habitat for prey. Though the weather had not been agreeable with the lack of blue sky and sunshine, we felt blessed to have seen six of these magnificent creatures in one day. 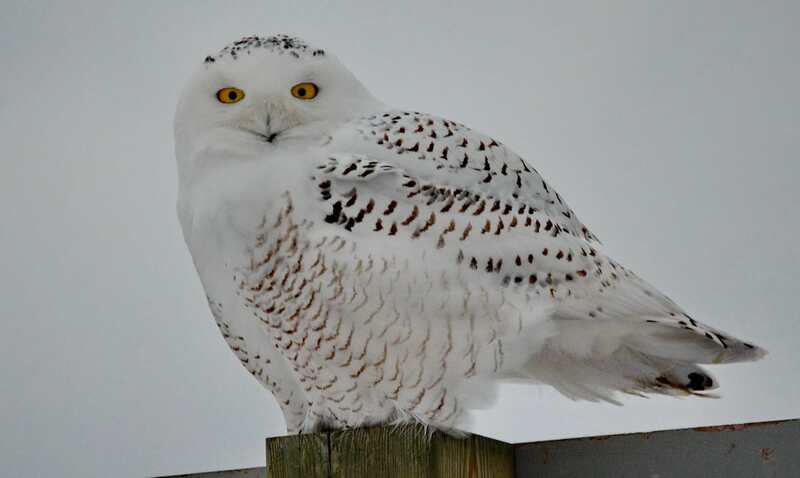 Given that they are one of the largest species of owls in North America, Snowy Owls are downright impressive! And we had found two on our own! That was something to be proud of, too. On my dock this morning April 23rd 2018was less than 10 feet away from a male Snowy Owl. Shore of Lake Huron around the 45th parallel, just looking at each other until a nosy crow decided to “bomb” the intruder. 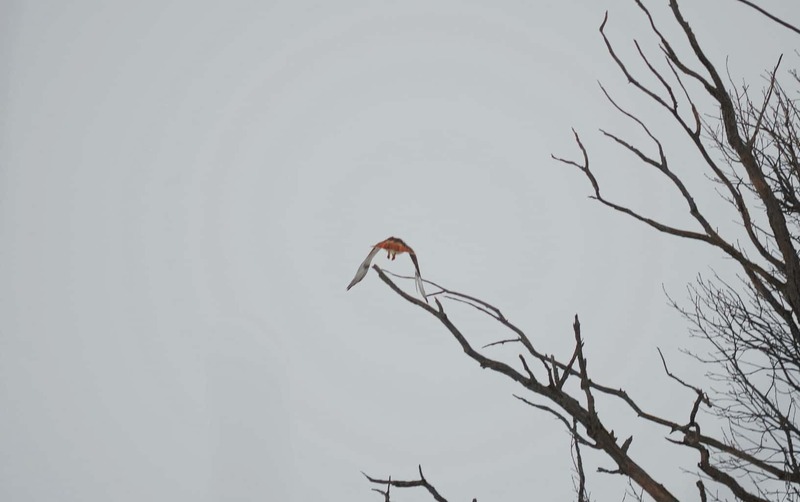 Owl flew off the peace of Lyle Island. next time will have my camera with me!!! That is so exciting, Peter. What a way to start the day! We’ve never been that close to a Snowy Owl, but when it is their choice to land near you, all you can do is rejoice and soak up the moment. Great photos. I’m sure you had a great time locating them. 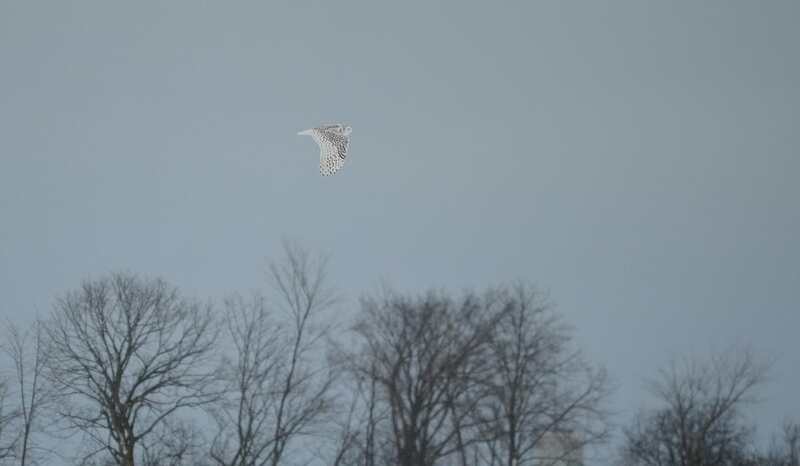 A friend and I have spotted snowy owls around the 401 corridor over the past few weeks. Unfortunately we were driving at the time, so no photographic evidence is available. thanks for sharing your sightings with us. We have heard of very many owls being sighted this year owing to the irruption occurring in southern Canada and the northern United States. So nice to see such beauties in our midst.